"code" elements are inline elements. "code" elements can not be used at block level. Contents of "code" elements will be displayed in a mono spacing font by most browsers. 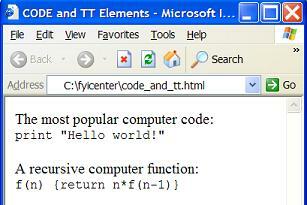 "code" elements will be treated like "tt" elements by most browsers. "tt" elements may not be supported in future versions of XHTML, You should not use "tt" elements in your XHTML.